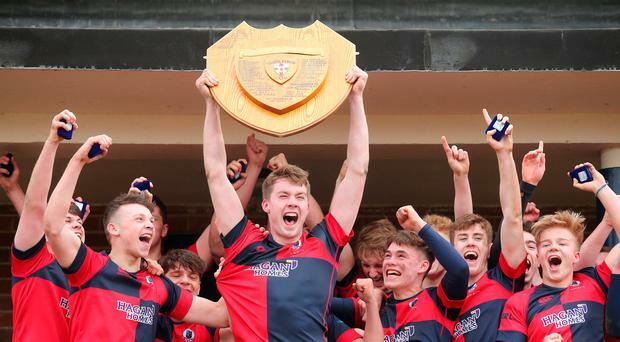 It was sweet revenge for Ballyclare High in the Danske Bank Subsidiary Shield final yesterday as they defeated Down High - their conquerors in last year's decider - 34-28 at Pirrie Park. The large crowd was entertained as a game full of open rugby and 10 tries saw Ballyclare win their first trophy since the Schools' Cup in 1973. Ballyclare opened the scoring when second-row Josh Young crashed over from close range. The holders bounced back when winger Ronan Patterson ran in for the first of his three tries for Greg Hutley to goal. After a line-out, 'Clare flanker Owen Lockhart dived over. Soon after, the ball was spun wide for full-back Ross Herron to score and Adam Clarke to goal. At that stage they had opened up a 10-point lead but Patterson again showed his pace to reduce the arrears to 17-14 at half-time. Ballyclare had the better of the exchanges in the third quarter with flanker Adam Campbell, who was man of the match, finishing off for Clarke to goal. Young then showed his strength for his second and the Antrim team was 29-14 in front. Down got back in the contest after Hutley converted a try by Andrew McCoubrey but an intercept pass around halfway by Ross Patterson virtually sealed the tie in 'Clare's favour. Undaunted, Down kept pressing and in the last move a cross-kick was gathered by Ronan Patterson, who touched down for another converted score. Proud Ballyclare coach Mike Orchin-McKeever said: "They showed excellent game application and management. The backs executed great skills in catch, pass and evasion. It's wonderful for the school and supporters." John Gunson felt his team made too many mistakes. He said: "We were always chasing and although we fought back time and again, that intercept try was a real blow. The boys kept going and we finished with a fine try."